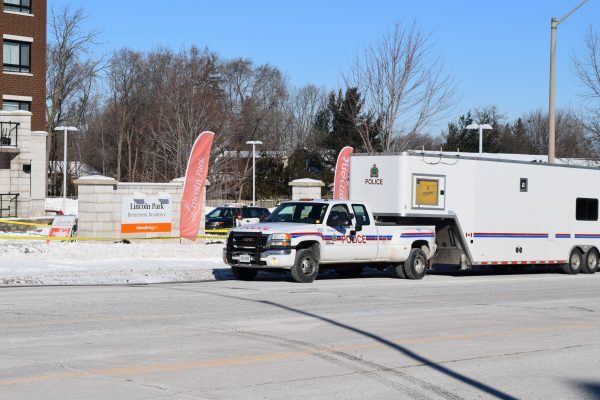 Police are releasing little information after the murder of a 30-year-old woman at Lincoln Park Retirement Residence in Grimsby Friday, Feb. 1. About 4:30 a.m. Niagara Regional Police Service’s 8 District officers were called to Lincoln Park. Officers and paramedics from Niagara Emergency Medical Services found a female requiring medical care for serious injuries. The woman – identified Tuesday by police as 30-year-old Amber Cobean of Toronto – was transported to a local hospital where she succumbed to her injuries. Mark Burrell, 39, of Toronto has been charged with second-degree murder. He was remanded into custody pending a bail hearing held yesterday (Wednesday) at the Robert S.K. Welch Courthouse in St. Catharines. “We have not released the cause or nature of the injuries,” said NRPS media relations officer Phil Gavin. Bartlett Road from Central Avenue to Main St. East was closed for the investigation much of the day. Investigators did confirm the victim and the suspect were known to each other. While Bartlett Road was closed and officers had the grounds of Lincoln Park taped off while investigators continued their investigation inside, facility officials noted the incident did not involve anyone on their staff or a resident. “The tragic incident that took place overnight was unconnected to this residence, and did not involve any team members or residents. Everyone here is safe, and we appreciate the rapid response of local police,” said Dave Bourne, director of communications for Sienna Senior Living. Anyone with information is asked to contact detectives at 905-688-4111 extension 9104.